Until we actually have hard facts instead of supposition and rumour, I’m steering well clear of the whole Lonmin/Marikana issue. However, if like me, you’re searching for those hard facts, it seems that the mainstream media isn’t the place to be looking. Whichever side you’re on, you surely can’t help but feel some pity for the rock drillers who – as we’ve been told here, here, here, here and here – earn just R4,000 per month. How one can survive, let alone support a family, on that amount is beyond me. If this increase applies to the whole compensation package it would push gross earnings – with and without bonuses – to between R11 000 and R12 000 per month. The net income of rock drill operators may well be considerably less than this – after deductions – but this is the cost to company. If these figures are correct, it makes it even more bewildering, bizarre and tragic that so many lives were lost in search of what amounts to a R500 per month increase. 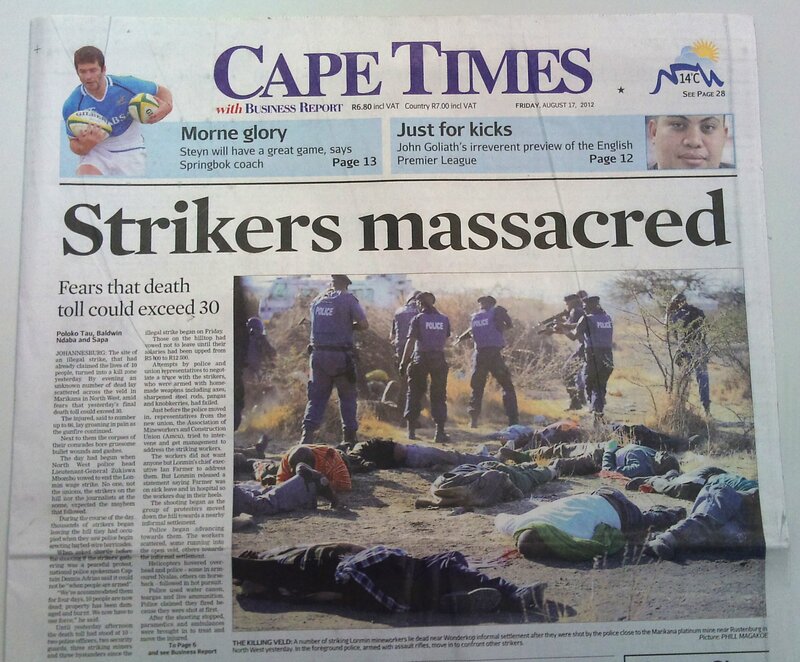 One has to ask why no-one in the world’s media appear seem to have bothered to verify the R4 000 figure… Given the critical nature of this information for any analysis of the strikers demands it seems like a very basic mistake. Meanwhile, South Africa’s news24.com seems to have evidence (via Al-Jazeera) that police were indeed fired upon before opening fire upon the protestors. The video is worth a watch. I’ll leave the decisions as to whether R10,000 per month plus bonuses is an acceptable wage or whether the two shots apparently fired at police merited their response up to you. But wouldn’t it be nice if the journalists paid to report facts, actually reported facts? While facts are hard to come by and people are wildly speculating and accusing everyone of everything, it strikes me (no pun intended) that given the situation yesterday, we would either be looking at the headline above or something along the lines of “Police massacred”. Was there another option? There surely should have been. My feeling is that we shouldn’t be concentrating on what happened yesterday, more on the events over the previous weeks that led to the obviously untenable situation that occurred yesterday afternoon.